I am so anxious for my holiday festivities that I am practically counting the hours as they go by. Not only will the time off be greatly appreciated, I’m doing a big family get-together this year. This year, we celebrate in Chicago where the bulk of my mother’s side of the family lives. I’m not looking forward to the cold (or the loooooooong drive), but I am looking forward to seeing family I haven’t seen in quite some time. Been a while since I’ve done a stir fry, though this one did not go the way I planned. The garlic did not come out as strong as I wanted, though the potatoes and green beens kept a good texture. I’m not sure where I’d take this if I did it again; perhaps asparagus over green beens, maybe some rice wine and more garlic sauce. Still, a good quick meal. 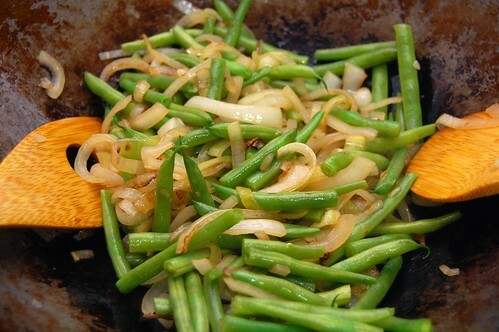 Par boil the potato and green beans separately in salted water for 3 minutes each. Drain and set aside. 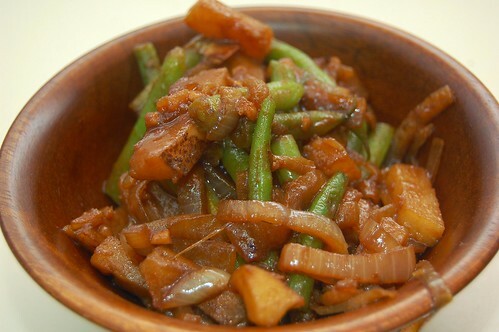 Saute your onions in oil under medium high heat until brown; approximately 3-5 minutes. Add garlic and continue until fragrant. Add your potato, green beans and sauce and cook for 5 minutes. Raise the heat, ad the water and cover. Cook until water has mostly boiled away. Enjoy. « Food Photography – Christmas Cookies!